Gabe and Priscilla Tuft hit Las Vegas to Celebrate Priscilla’s birthday (and get a few workouts in)! Train hard, party hard, live life to the fullest. Forget all of the crap you hear about not enjoying life. There has to be a balance, and these two showed us there definitely can be. 3 1/2 weeks of strict keto dieting led up to this four-day retreat at the Cosmopolitan in Las Vegas. Also, below the video is the full chest workout Gabe and Priscilla did in Vegas! Saturday’s chest workout was no joke. After a full Friday night of enjoying the Vegas Lifestyle at Rose. Rabbit. Lie in the Cosmo, the next day these two hit 24-hour Fitness on West Flamingo Road to crush a chest workout. 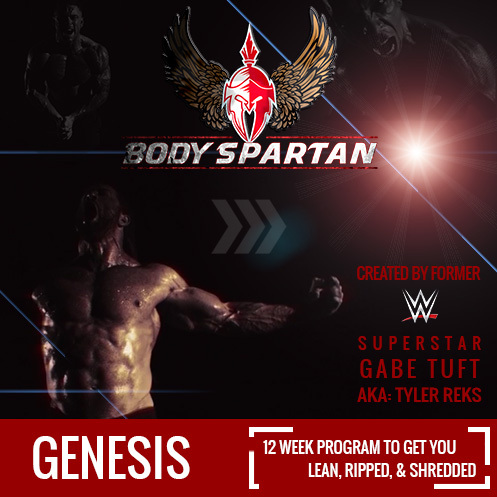 Gabe’s currently suffering from an injury to the long head of the biceps in his right arm, and the same tendon is starting to tear, so they worked this chest workout around that injury. There’s no free-weights to ensure all the movements can be controlled, but the volume is extremely high. While there’s only three exercises to do, there’s 18 sets total including drop sets. If you want to leave the gym with a killer pump, this is the workout for you. Be sure to check the scene in the video above when Gabe finishes the workout and spends a few seconds flexing in the mirror. The pump is real! This entire workout is about the mind-muscle connection. You have to squeeze and contract your pecs throughout the entire range of motion. This includes consciously thinking about flexing your pecs to move the weight and taking your anterior delts and triceps out of the movement. With six sets, to maximize your performance, you’re going to want to use a much slower tempo with brief holds at the bottom and top of the movement. Soft lock the arms at the top to keep tension on the pecs and get a half second to full second hold at the bottom, never letting the arms of the machine touch the base (constant tension on the pecs). Try to start with moderately light weight, get the blood into the muscles, then start slowly increasing the weight each set. The last set is a double drop set. Gabe ended with three plates on each side. Each drop, he pulled a single plate of each end and went right back to work, without any rest in between the drops. There’s a ton of different ways to do these. In this workout though, Gabe chose to do a bent over fly that mimics a flat bench fly. Priscilla, on the other hand, did a more upright, traditional cable fly and targeted the lower pecs slightly more. Either way, use the same tempo that you did with the Hammer Strength Press and avoid any swinging motions. Pull your shoulders back to remove as much of the anterior delt recruitment as possible. Again, in this workout we are performing exercises that minimize recruitment of the biceps tendon and long head of the biceps where it connects to the pec. The Smith Machine is a great way to prevent additional injury to that area as you can focus more on flexing and contracting the pecs, rather than stabilizing the bar.